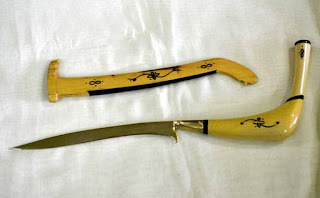 Rencong Aceh is a traditional weapon from Aceh. Even because it was so famous, Aceh was given the title "Tanah Rencong". Rencong symbolizes the greatness of the nobility of aceh and also the courage of the martyr fighters, as well as the people of Aceh during the Dutch colonial Japan. Almost every fighter in Aceh, equipped himself with traditional rencong weapons as a means of self-defense. Rencong has various levels, for the Sultan is made of gold engraved as quoted verses of the Holy Qur'an, while the other Rencong is usually made of silver, brass, white iron, wood and ivory. The Acehnese people connect mystical powers with Rencong's weapons. Rencong is still used and used as a fashion attribute in every Aceh ceremonies. The people of Aceh believe that the form of Rencong represents the symbol of Bismillah in the beliefs of Islam. Due to the history and popularity of Rencong, the world community referred to Aceh as "Tanah Rencong"
Currently Rencong has been proposed to be the World Cultural Heritage Heritage of UNESCO by Balai Preservation Nilai Nilai Budaya (BPNB) Aceh.